If you’ve been following our Photos of the Week, you’ve probably seen the work of Chris Arnade, a New York-based photographer who creates particularly lovely images. Arnade has a particularly good eye for urban characters. 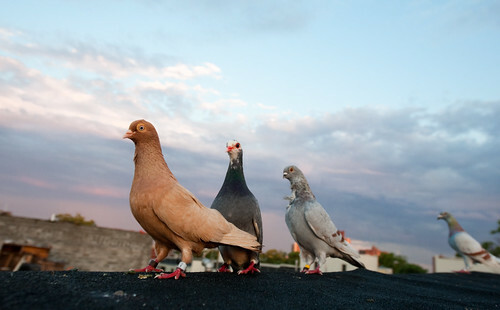 Last week, he emailed me about a series he has been working on about men who raise pigeons on the rooftops of Brooklyn. “A real urban sport that is dying out as gentrification pushes into the outer boroughs,” he explained. Arnade agreed to share his photos and commentary with us below. 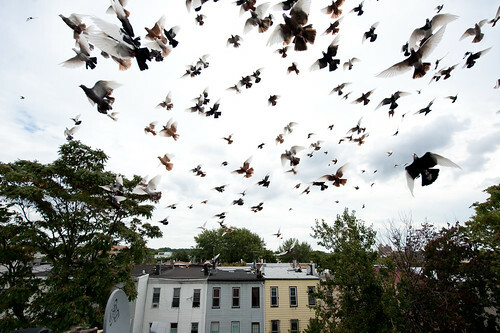 I first noticed the beautiful flocks of pigeons high above Maria Hernandez Park in Bushwick last summer. At the time I had no idea that they where part of an old sport. 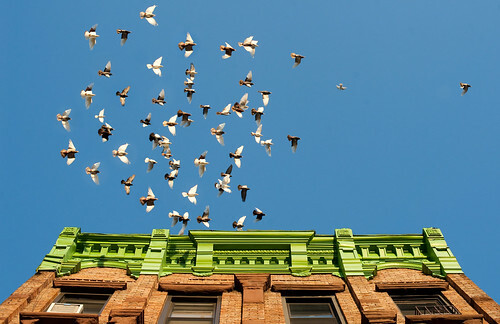 Brought over by the Italians, Bushwick used to have well over 100 guys (yes, all of them are guys) who kept pigeons on the roofs. Now it’s only about 20. Not raised to race — thats another sport — they are simply collected and bred and then flown to highlight their beauty. These days, its mostly Dominican and Puerto Rican men; every one of them has been more than happy to show me their flocks. 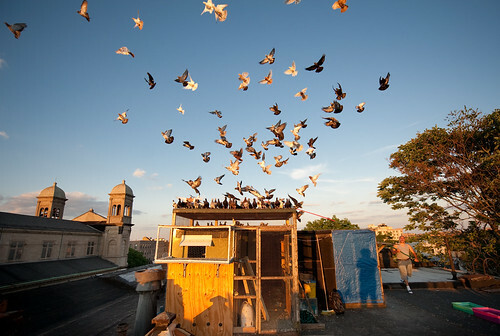 Kept in coops on various roofs, the pigeons are fed and flown almost daily. 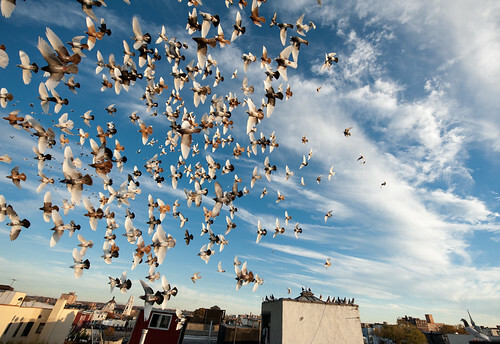 Once you view the flocks flowing and swirling high above Brooklyn, catching the shifting sunlight, you start to see the artistry involved. I have been watching the circling pigeons from Maria Hernandez Park for some time, hoping to meet the guys who keep them. I talked my way up on to one of the roofs, with three big coops and four guys. Luis, who keeps most of the birds, was a great host and loved the camera. Here he is holding a baby. The man knows and loves pigeons. They are beautiful to watch circling overhead but even more amazing up close. Long poles with various flags, as well as whistles, are used to signal the flock. 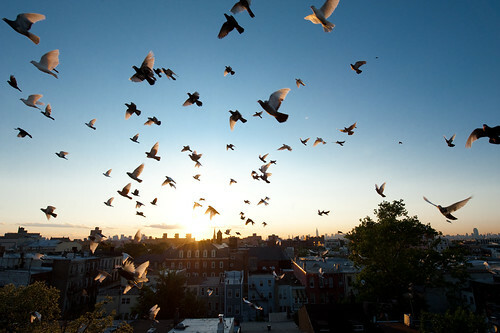 The birds require feeding and flying daily. When you are on the roof, the breezes, views, and wonderful swirl of pigeons makes you understand why these men become obsessed with the birds. I was back on Luis’s roof this afternoon. Almost every Pigeon Keeper had his birds up; the sky was filled. We watched as a Red Tailed Hawk hunted pigeons, all the while being chased by sparrows who use the hawks feathers for nests. 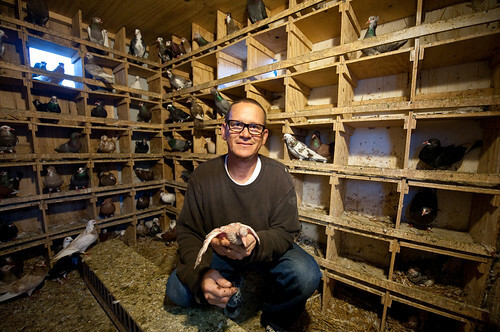 Willie is the superintendent in the building where he keeps his pigeons. 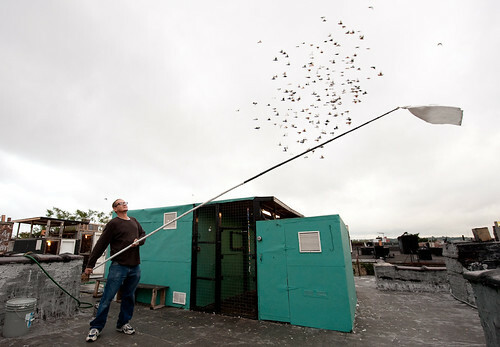 Presently, he has the most pigeons in Bushwick. Here he is inside one of his three coops. Delon spends time on his Uncle Luis’ roof, helping with the pigeons. He says he used to be mostly a snake and lizard kid, but is now becoming a pigeon guy, like his uncle. His uncle taught him how to catch and hold a pigeon recently, so he had to show me. Inside Whitey’s “tree fort” on the roof where he keeps his pigeons. Whitey was born and bred in Bushwick; one of the pictures in the background is him as a kid in Knickerbocker Park, now Maria Hernandez Park. He is funny as hell and a great story teller. 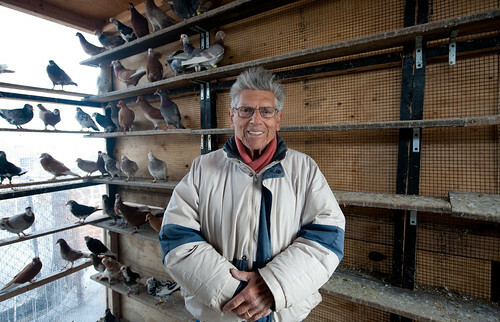 He’s got the sweetest set up, an entire roof atop an old warehouse, and some beautiful pigeons. 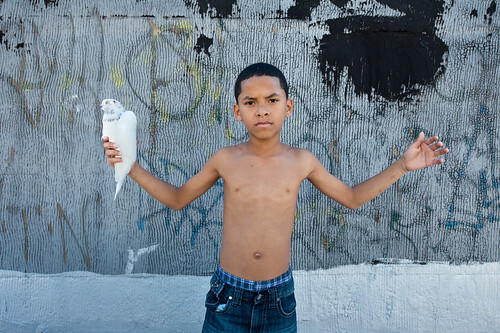 Frankie has been keeping pigeons in Bushwick since he was seven. He just turned 87. He bought his first pigeon for a nickel and kept it on the fire escape of his apartment, to the annoyance of his parents. 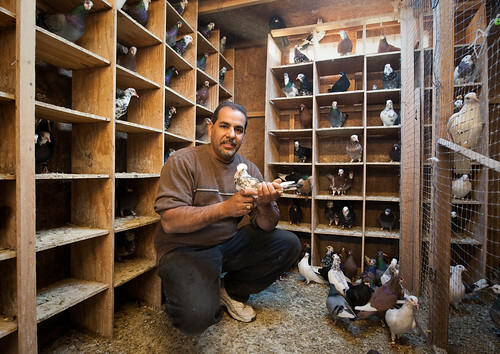 Louis has been keeping pigeons since he was seven, back in the Coney Island projects. 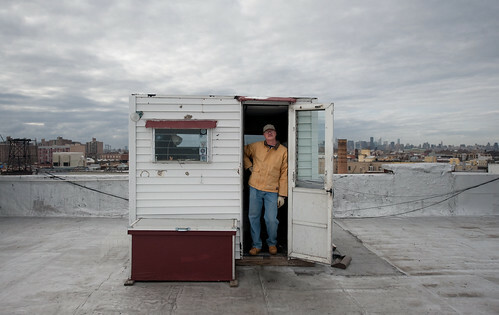 Now in East New York, he and his son Anthony are on the roof almost every night. Louis said it kept him off the streets and out of trouble as a kid, so of course he was going to pass it down to his son Anthony. 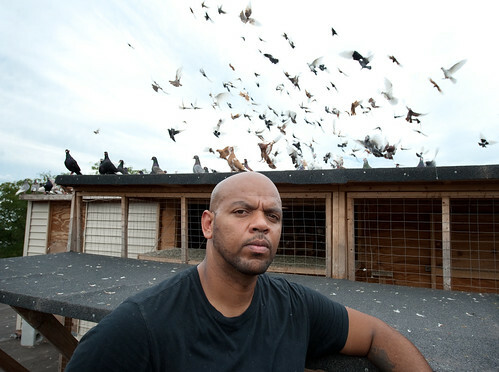 David Malone, friends with Mike Tyson since childhood, still keeps pigeons with Tyson on a roof in Bushwick. 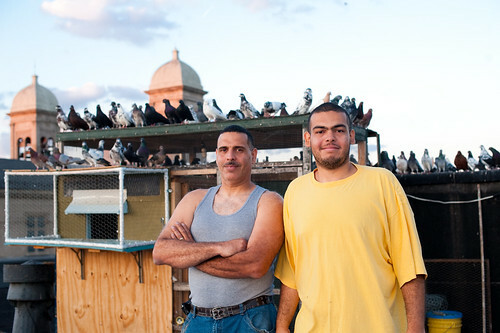 Both grew up in Brownsville and have been keeping pigeons since then. 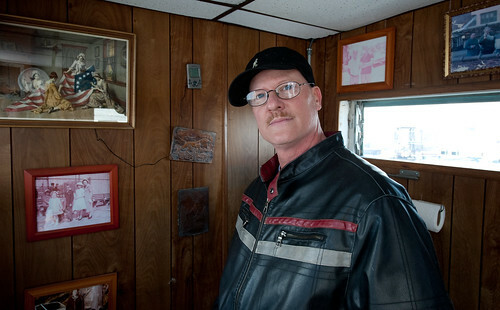 David, who spends his time between Bushwick and Las Vegas, could not have been more welcoming. Their roof has some of the most amazing birds I have seen. This entry was written by Christopher DeWolf , posted on Tuesday December 06 2011at 09:12 am , filed under Environment, Society and Culture, United States and tagged Brooklyn, New York, Rooftops . Bookmark the permalink . Post a comment below or leave a trackback: Trackback URL.